As a Client Partner at INTOO UK & Ireland, Josh is responsible for developing and managing relationships with corporate clients in the UK and Ireland. Working across multiple sectors, from small start-ups to FTSE 250 companies, he focuses on providing solutions that will enhance the capabilities of Senior Leaders and Executives, helping to transform individual and overall business performance. His key aim is to get to the core of clients’ challenges and provide solutions that focus on long term development and are embedded in the organisations values and culture. Josh works with organisations and individuals to create dynamic, thought leading solutions that allow organisations to maximize engagement, encourage learning, improve leadership capability, and implement successful change. Prior to INTOO Josh completed his MBA studying leadership, marketing, entrepreneurship and statistics. 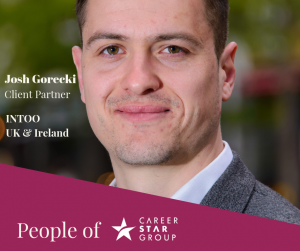 Once completed, he embarked on a career in Talent Management working with one of the world’s leading recruitment consultancies and joined INTOO in 2016.